Fire up the grill and dress up your corn on the cob! 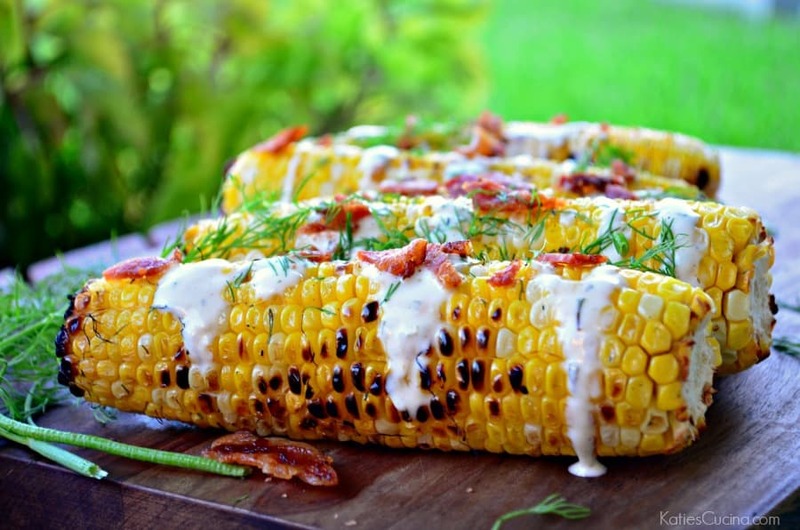 Learn how to make my easy recipe for Bacon, Ranch, and Dill Grilled Corn on the Cob! I feel like everything is better with ranch dressing and bacon. I love to grill corn vs boiling it on the stove top. One less thing for me to clean after dinner. In my book that’s a win-win! I got the idea for the Bacon, Ranch, and Dill Grilled Corn on the Cob after I made my grilled asparagus with bacon ranch Greek yogurt dressing last month. I feel like I now want to smother all things in bacon and ranch dressing. I decided to dress up our corn on the grill. I also did something sinful you guys. I rolled the raw corn in bacon fat! Can I tell you how amazing this corn is? The bacon fat adds a hint of extra flavor to the corn and keeps it moist while cooking on the grill. I also sprinkled the salt and freshly cracked pepper over the corn and then placed it on the grill. I find that placing the corn vertically on the grill grates is the trick to it not rolling around. Then you can easily rotate the ears of corn with out them rolling all over your grill. I think it’s human nature to place everything on the grill horizontally. At least it is for me. I’ve been grilling corn for years and just this last time did it dawn on me to place the ears of corn vertically. Doh! Then once you take the corn off the grill you drizzle it with ranch dressing and then sprinkle on the crumbled bacon and fresh dill. No need for gobs of butter because the ranch and bacon do the job. My husband and I may or may not have consumed 2 each at dinner. 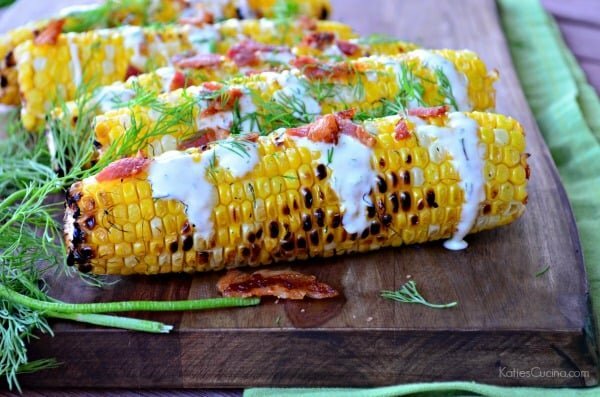 I honestly think I could have just made these Bacon, Ranch, and Dill Grilled Corn on the Cob and we would have been 100% ok with that being dinner! Nothing else. Just corn on the cob. 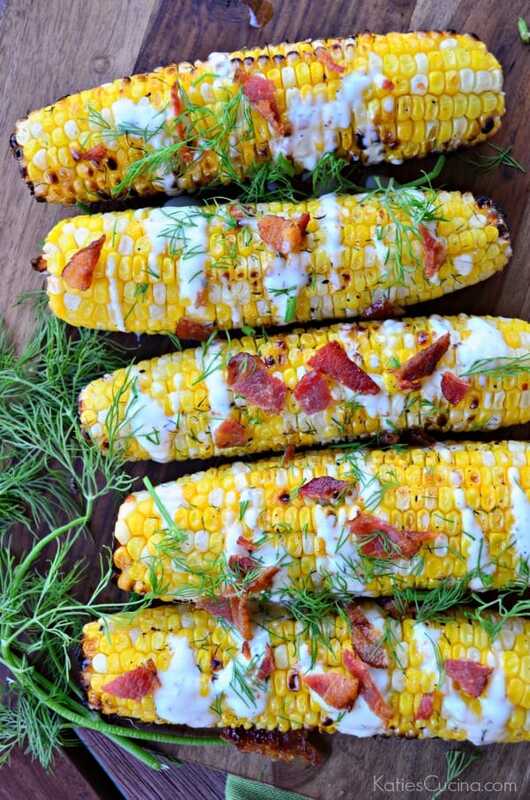 So if your bored of the same old corn on the cob, grill it, and then dress it up with creamy ranch dressing, crumbled bacon and fresh dill! Preheat grill to high heat (around 400 degrees Fahrenheit). Cook bacon in a skillet until crispy, about 5 minutes, flipping once. Remove the pan from the heat, and place bacon on a paper towel to drain. Shuck and clean corn on the cob. Carefully roll each ear of corn in the bacon fat. Lower the grill burners to medium-low. Place corn on the grill. Cook for 15 minutes, rotating every 5 minutes. Remove the corn from the grill. 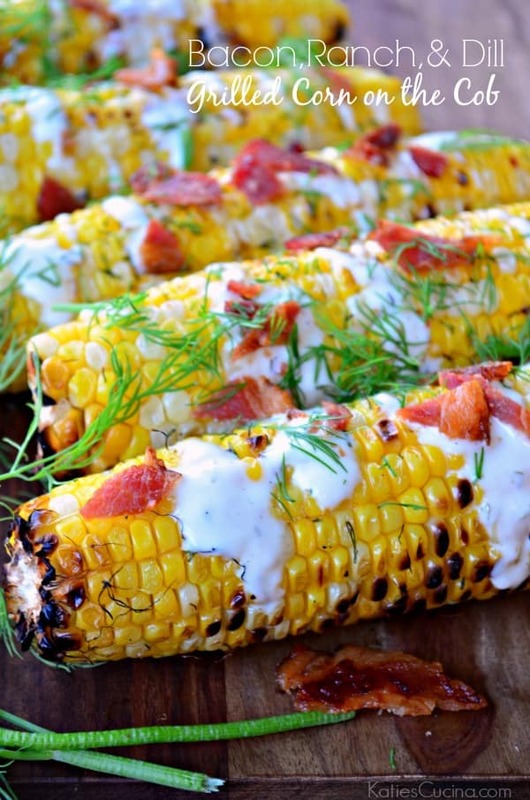 Drizzle ranch dressing on top, sprinkle minced dill, and crumble bacon over the ears of corn. Serve immediately.